Magnus Bunnskog is a composer, and works as dramaturg and artistic director at Audiorama. His background from theatre and writing resonates in his musical work as a specific interest for the relation between voice, performativity and music. As a member of the Albatross Theatre in the early 1990’s,touring Europe and West Africa with a number of productions, he studied radio and film production, writing, and eventually got degrees in Theatre Studies at the Stockholm University, and music composition at the Royal College of Music and CNSMD of Lyon, France. He is currently working on two commissions from the Swedish Arts Council: one new work for the Stockholm Saxophone Quartet, and a hörspiel for Audiorama. 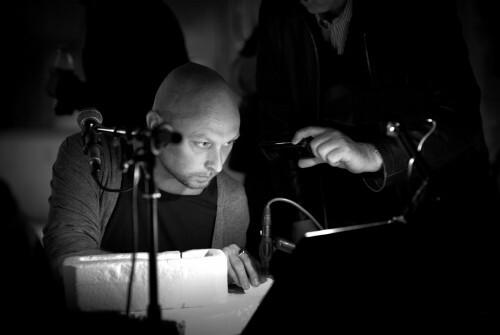 He has written a radio opera for the Swedish Radio Theatre and the Swedish Radio Symphony Orchestra, produced live-streaming performance art at Splintermind/Beeoff, worked as the musical director of the Folkoperan Opera Showroom, made music for player pianos, symphonic choirs, turntable sextets and much more. His works has been performed at festivals such as Sound of Stockholm, Norberg Festival, Transart Bolzano (Italy), Musik Biennale Zagreb (Croatia), Sügisfest (Estonia), Nordic Music Days, Bergmanfestivalen och SPOR Festival (Denmark).